We like the ease of use and lack of any mess or residue with this device. For those who have gardens, we love these granules for their all-natural yet effective formula. If you’re looking for a natural all-around spray to keep squirrels at bay, this is a great pick. Whether you’re sick of squirrels overtaking or damaging your flower pots, garden areas, nesting in your attic, or spending too much time around your car, you have good reason to dislike these rodents being around. Squirrels increase the risk of rabies or disease-carrying fleas for your pets. If you hear scratching, rustling, or clicking sounds in your attic, or see signs of droppings in your garage, there’s a good chance you have an infestation. Squirrels can not only spread illnesses to pets and humans but also damage wiring and insulation. As rodents with front incisors that continue to grow unless they chomp regularly, squirrels are always searching for items to chew. This can cause expensive electrical problems if they get into your wiring and even create fire hazards in your home or vehicles. Dealing with rodents does not always mean having to use poison or traps that kill. Several options exist that deter squirrels without toxins or dealing with dead animals. Not to mention, keeping rodents away while being kind to the environment and what you inhale while using products is essential, also. So, we’ve rounded up our top four squirrel repellents for 2019. Nothing to spray, no granules to deal with. Can be doubled up for increased power. Not audible to human ears. A little pricey for one device. Roughly $27 for one unit. Coverage of 155,000 square inches. 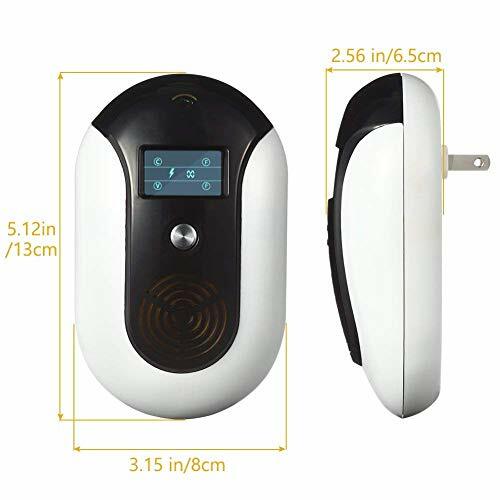 The TangN Ultrasonic Electromagnetic Pest Repellent is an updated version of the standard ultrasonic pest repellent now standard on the market. With a combination using both ultrasonic and electromagnetic waves, you have the dual-action deterrent of rodents. The electromagnetic waves are meant to provide better wall penetration than normal ultrasonic alone. The ease of this product is part of the beauty. Just turn it on, and it’s supposed to do the job. The ultrasonic and electromagnetic waves stimulate the auditory and nervous system of pests. So, the premise is it makes them feel uncomfortable and forces them to leave your home. All you need to do is plug this unit in—no batteries required or need to be replaced. Also available in one-gallon spray formula. Several customers found it ineffective. Covers approximately 1,440 square feet. Around $14 for the two-pound container. Active ingredients: putrescent whole egg solid, rosemary oil, peppermint oil, and cinnamon oil. 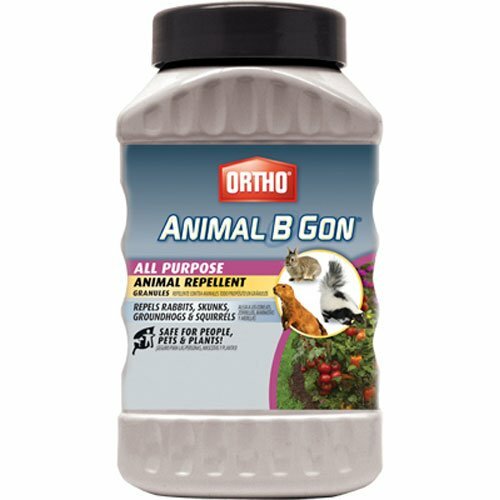 The Ortho Animal B Gon All-Purpose Animal Repellent Granules are fantastic for those who have rodents digging up flower beds or pots. You just spread the granules at the base of your plants to minimize animal damage. Extremely easy to use. The smell and taste of these granules are unpleasant to small animals such as squirrels, rabbits, and chipmunks so that they are deterred from your plants and pots. This is designed as a “no stink” formula. Safe for the use around people, pets, and plants. Free of harsh chemicals, non-toxic. Also available in one-gallon size. Can be used in almost any location. The spray bottle is 32 ounces. Runs around $20 for one bottle. Also available in one-gallon with a hose sprayer. One-gallon size is around $37. Active ingredients: garlic oil, peppermint oil, rosemary oil, white pepper oil, and vinegar. The Exterminator’s Choice All-Natural Rodent Defense Spray was formulated by professional exterminators for fantastic results. 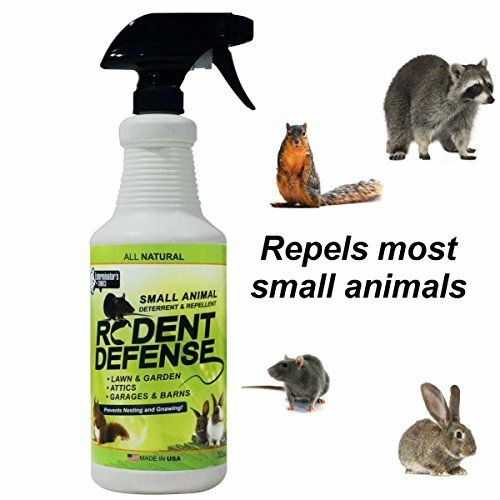 This spray repels not only squirrels, but also rats, mice, raccoons, and cockroaches. The natural blend of ingredients makes it safe for use around your family and pets. If you’re looking for an eco-friendly, non-toxic spray, this is an excellent choice. Simply spray the repellant around your home, garage, attic, basement, your car, and even in your garden. With a blend of four well-known deterrent essential oils, this combines ingredients known to be disliked by several types of pests. Use caution to avoid spraying in eyes or inhaling, as it does contain garlic oil and white pepper oil and could cause irritation to eyes or lungs. Wash hands if the product gets on hands, especially before touching your face or eyes. Little or no smell in the cabin of the car. Available in 32 ounce and one-gallon sizes. Ineffective for a small ratio of customers. Just over $21 for one bottle. One-gallon is $43 and comes with sprayer hose. Active ingredients: peppermint oil, rosemary oil, garlic oil, white pepper, and vinegar. The Exterminator’s Choice All-Natural Vehicle Protection Rodent Defense Spray is an excellent idea if you do not have a garage to park in or may have a rodent infestation in your garage. This spray is made with an all-natural blend of essential oils known to be deterrents to several pests. With continually-growing incisor teeth, squirrels are programmed to chew on anything to keep their teeth the right length. The wiring and other components of your car are an ideal location in a rodent’s view for this behavior. You can spray this around your garage, along your undercarriage, near the tires, and lightly in the engine compartment. Use caution near flammable parts of your car. Spraying a heavy dose on the ground around your car can be very helpful. Use caution to avoid getting in eyes or inhaling, as this does contain garlic oil and white pepper oil. Squirrels can be cute from afar, but if you’ve experienced rodents nesting in your attic or chewing the wires of your car, they quickly lose their adorable appeal. It is in a squirrel’s nature to bury seeds and nuts, often causing problems to gardeners in both flower beds and pots with plants outside. They also have a habit of chewing. This can lead to significant damage to expensive electrical parts, and cause fire hazards in cars and homes. Diseases are also a risk with squirrels, perhaps more than you might expect. The first thing that likely comes to most you mind with squirrels and disease is rabies. Rabies is a real threat, as squirrels are one of the animals that often contract rabies. Even if you have vaccinated pets, rabies can still result in wild behavior and bites or scratches. However, rabies is by no means the only health risk from squirrels. There many diseases that can be spread through squirrel feces if they infest an area like your attic. Similar in the way sickness can be transmitted by other rodents, squirrel feces are a health risk. The most significant concern regarding squirrel waste is that of leptospirosis. Leptospirosis is a disease that is spread through the feces and urine of rodents. Salmonella is another sickness that you get very easily from cross-contamination with squirrel waste. Salmonella will often cause symptoms like diarrhea and vomiting. Plague, believe it or not, is still active in the world today and even in the United States. One of the most substantial risks of the disease are fleas on rodents such as squirrels. Plague occurs in the western United States, especially in areas such as Arizona, California, Colorado, and New Mexico. If you live in these areas, keeping squirrels away from your yard is not a bad idea. The bacteria that causes plague is spread by fleas and rotates naturally among wild rodents. Bubonic is the most widespread type of the illness. Bubonic plague most often occurs after being bitten by an infected flea—usually directly from a rodent but even more often from a flea infestation that originated from rodents such as squirrels. One of the most substantial risks of the disease are fleas on rodents such as squirrels. If you notice signs of squirrel activity near your pets, vehicles, birdfeeders, or garden areas, it’s best to do whatever you can to deter them. If you’re opposed to poisons or traps, clearly there are plenty of options to try out to keep your home, car, and family safe. You can combine sprays with visual deterrents, as well, such as decoy owls or “scare cats”. Or you can mix products such as the granules with a sprayer for optimum results. These are eco-friendly, non-toxic ways to keep squirrels out in the wild where they belong, and away from your pets, wiring, garden, and attic.